“Gremolata,” says Chef Canora, "is like Italian MSG. It makes everything taste good.” It’s important, he adds, to chop the parsley, lemon zest, and garlic cloves together, not separately. Ready-made parchment packets are available in the supermarket’s foil-and-plastic-wrap aisle. In a large bowl, cover the porcini with 2 cups boiling water. Let sit until the mushrooms are softened, about 20 minutes. Transfer the mushrooms with a slotted spoon into a clean bowl. Strain the soaking liquid through a coffee filter or paper towel and reserve the liquid. Position the racks in the upper and lower thirds of the oven and heat the oven to 375°F. Combine the parsley, lemon zest, and 3 of the garlic cloves and chop to combine. Add a pinch of salt and mix well. Transfer the gremolata to a small bowl and set aside. Heat 2 Tbs. of the oil in a 12-inch skillet over medium-high heat. Cook half the mushrooms with 1 of the garlic cloves smashed with the side of a chef’s knife and one sprig rosemary. Season to taste with salt and pepper and cook, stirring occasionally, until the mushrooms soften and become golden, about 5 minutes. Transfer to a large bowl and repeat with the remaining oil, mushrooms, garlic, and rosemary. Fold three 12x17-inch pieces of parchment in half [lengthwise or crosswise? EJ]. Cut each piece into a half-oval as large as the paper allows, leaving the folded side uncut. Unfold the parchment ovals and distribute the mushroom mixture equally in the center of one side of each oval. Evenly drizzle the lemon juice and sprinkle the gremolata among the 3 packets. Season to taste with salt and pepper. Fold the parchment over the mushrooms and crimp and pleat the edges to seal tightly, starting at one corner of the fold and working your way to the other end, making sure the seals are tight. You can do this up to 2 hours ahead. 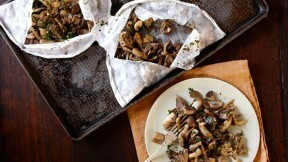 Put the packets on 2 baking sheets and bake until the gremolata is fragrant and the mushrooms are warmed through, about 5 minutes. Slice open the packets and serve family style with sliced lemon.